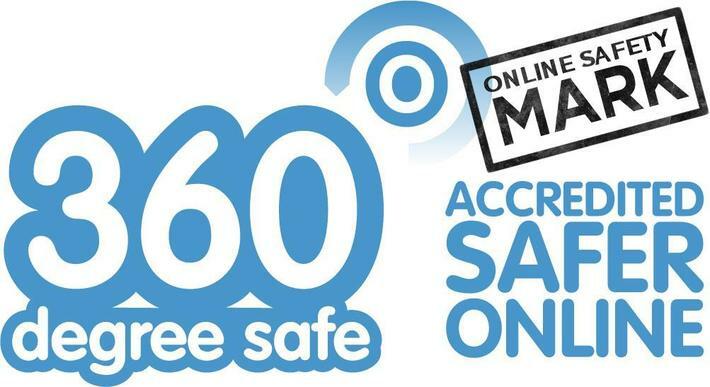 Awarded 360 degree safe accreditation! Schools that are able to show good practice in their Online Safety policy and procedures can apply for the Online Safety Mark. The first step towards gaining the mark involves an online application to South West Grid for Learning and submission of a completed 360 degree safe self review in which the school has reached at least the benchmark level in all aspects (shown on the online tool). The school must also provide a full commentary for each aspect which describes how their provision for that aspect meets the required benchmark level. If there are good reasons why a school cannot reach the benchmark level in any aspect (possibly because of the size or governance of the school), this must be explained clearly in the commentary for that aspect for the assessor to judge whether or not the school is still likely to qualify for the Online Safety Mark. Following the application, the Assessor will check the completed 360 degree safe self review tool to ensure that the school appears (in its responses) to have met the benchmark levels and be ready for an assessor visit. The school is then visited by one or two assessors for a half day visit. Assessors will agree an agenda for the visit with the school based on an exemplar agenda. The assessor will meet with a range of staff, students / pupils, parents / carers and governors and will also carry out a brief review of some of the schools paper / online evidence (policies, minutes, audit logs etc). At the end of the visit the school will be informed by the assessor whether or not their application has been successful. The assessor will also suggest areas of strength and weakness in the school’s e-safety provision. There is a charge for the assessment. Click here to see the draft schedule for an Online Safety Mark Assessor Visit and here for additional guidance for applicants. Feedback from Online Safety Mark schools has been very positive. Click here to see a list of successful Online Safety Mark schools and here to see the feedback from these schools.